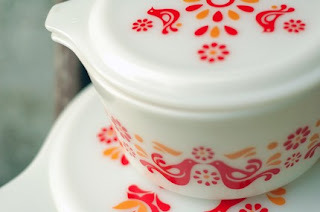 In perusing some new quilting blogs lately, I have noticed a couple of quilters who are also collectors of vintage pyrex. After looking at my Tupperware, some of which is really yucky dated itself, I would like a more attractive and sustainable alternative. Etsy, oh how easy you make it for me to fuel my "orange crush." 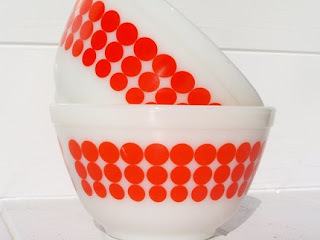 Aren't these stunning examples of vintage Pyrex? It's completely hard for me to believe that August is halfway over. Why do I even bring that up? Well, because that means that the holidays are (yikes) just around the corner. You know what I mean: Thanksgiving, Christmas, Hannukah, etc. Now why would I include Thanksgiving in that group? A holiday certainly but not generally considered a gift-giving occasion. Oh, wait. I do believe my birthday falls on Thanksgiving Day this year. Just sayin'....for anyone out there who finds this information to be interesting or helpful. Mark? Christa? Aaron? Ferris? Anyone? Anyone? Your B-day is the day before mine--mine is the 26th! Too cool! Don't you love how we have to really make sure people know about it too because it is so close to Thanksgiving or lands on Thanksgiving!! 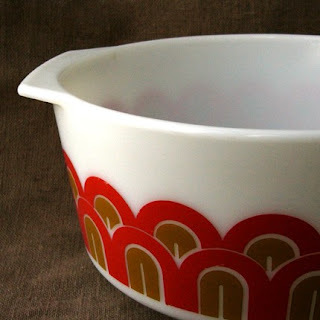 Love the Pyrex. So pretty to look at. 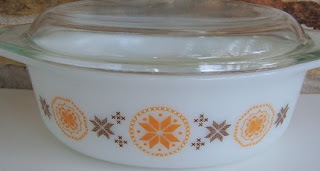 Why can't Pampered Chef go vintage---hehe! Ferris? You mean like as in Ferris Bueller? It looks like the selvage sister is very close to the edge. Beautiful Pyrex bowls. 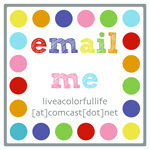 They were so colorful, weren't they? 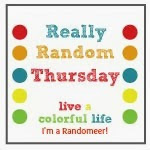 Maybe Color Therapy Thursday should have been titled Birthday Wish List! How thankful you will be to recieve gifts on Thanksgiving! For me, the holidays start with Halloween. Costumes to make, pumpkin cookies to make for neighbors, etc. Gotta get going if I am to have a Little Red Riding Hood and a Big Bad Wolf!! Any suggestions for a 5 year old Big Bad Wolf costume?!?! August is almost over, people! Fun pyrex! Thanksgiving will be extra fun for you this year! I love these dishes! I don't think I have any, but I know my mom and brother have some with interesting patterns and colors. My b-day is always around Thanksgiving too, so I love your hinting here! Those dishes are great! 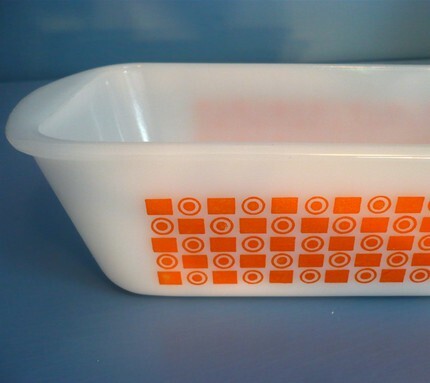 I remember my grandmother having Pyrex like that.